How do you name, that which cannot be named? 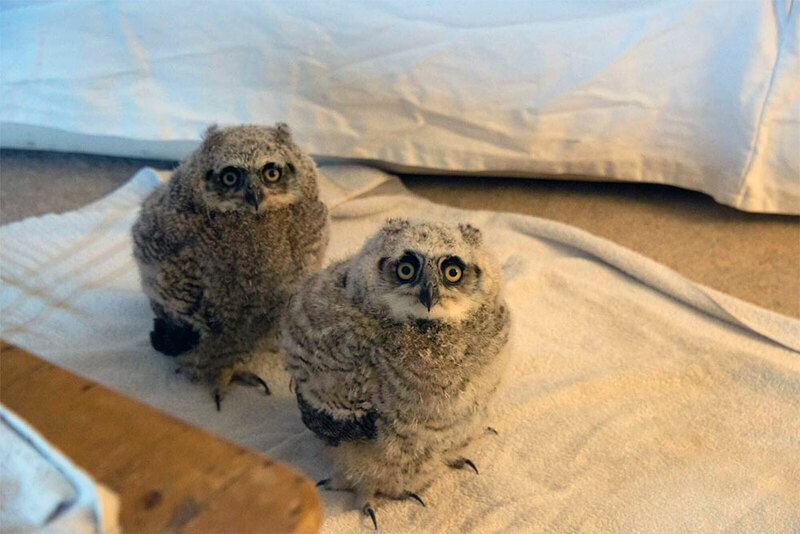 As mentioned in my opener, we’re not yet able to give these owls names. This is unfortunate, since maintaining an accessible log of their development depends in no small part, on being able to identify them individually. It’s almost as if names are useful. We could just refer to them as ‘he and she’, but I feel like that’s skirting awfully close to actively engaging in identity politics. My understanding of this behaviour, is that it allows Great horned owls (or owls in general) to triangulate objects. 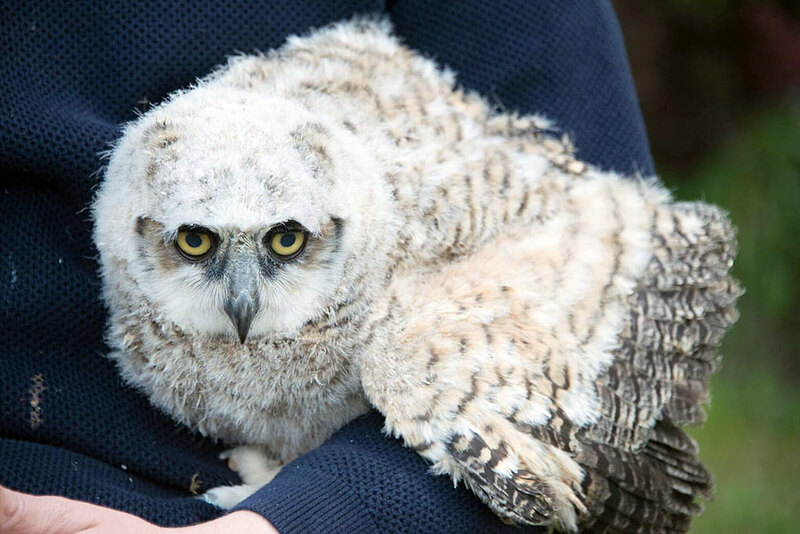 We do this with our eyes, but whereas (most) human beings (born outside of Stoke-on-Trent) can move their eyes independently of their heads, owls cannot. Their eyes are fixed into place, so this head movement is essentially the equivalent of what we might do with our eyes alone, when judging an object’s distance and/or size. Anna scoffs at my observations, asserting that said movement is actually indicative of excessive sass. “This girl knows where it’s at” she says, deciding that she will henceforth be referred to as Sassy Girl. The male, is to be known as Stupid Boy, which I argue is reductive, unfair and abusive. She reminds me that my only suggestions were “KF” and “C”. They are so, so small. Not that size is everything. Not – at – all. I don’t bother taking actual measurements (because I’m lazy, don’t judge me), but they can’t be more than nine or ten inches tall, fully stretched. Note: By fully stretched, I mean standing tall. Not with the assistance of the Duke of Exeter’s daughter. But they’re even smaller than they look, as I surmise that 99.99% of their body is a mixture of fluff and feathers. When I go to give them a stroke or pick them up, I’m quite alarmed by how small and bony their actual bodies are. This compels an even greater degree of care in their handling on my part, though I am conscious that successfully training them will require us to be confident and consistent in our interactions. As cute, young and small as Sassy Girl and Stupid Boy might be, I’m mindful that they’re still predators and as such, are capable of inflicting significant physical damage. Like children and Liverpool F.C. fans. Thankfully, this doesn’t require much adaptation – I’m fairly used to working with animals who are all about the mouth. While you might argue there aren’t many similarities between owls and great white sharks, both mean business when it comes to their eating apparatus. They’re designed to grip, crush, rip and tear (until it is done) prey and in lieu of hands, are also their primary means of physically investigating objects they come across. Which is obvious from the moment we start interacting with them. They’ll often take a few seconds to observe something, moving their heads to get a thorough sense of context before taking their curiosity further and gripping with their beaks. More often than not, they don’t just bite and let go, they’ll retain their grip momentarily, before re-positioning and going again. I do recognise a subtle difference in this behavior, from time to time. Sometimes, the bite follows a more erratic, fast paced head movement than usual, accompanied by a clicking noise made with their tongues. This naturally feels more aggressive and I conclude, is some sort of threat, which I validate through a couple of online resources. See, I can do learning. Some might say, “A bite is a bite. What does it matter?”. While I’ve no wish for this to become a massive digression, I do want to highlight why I think it’s important to understand the events leading up to an interaction, rather than simply draw a conclusion as to the animal’s intent by outcome alone. For example: If a grizzly bear rips someone’s head off, obviously it was in a bad mood and wanted to hurt that person. But what if the grizzly bear simply wanted to initiate a friendship by stroking their face and was unaware of their own strength? Clearly, I’m exaggerating for comedic effect, because I’m paranoid that without humor to compensate for my myriad of repulsive character flaws, people will leave me to die alone. outcome doesn’t determine the intent. Look at human babies, for example. I’ve been informed that as they develop, they will grab and mouth household objects liberally (often to the absolute exhaustion of their parents), I believe as a means of understanding what those objects are. Now, imagine that instead gums and spit, babies’ mouths comprised rows upon rows of steel plated blades. The results would be quite different, despite the intent being the same. This is why wildlife specialists (or just sad obsessives like myself) get so pissed off when injuries sustained by human beings from animal interactions (sharks especially), are so quickly publicised as being attacks. Sure, some might be, but I dare say the vast majority are identified as such due to the extent of the injuries sustained, rather than an analysis of what happened leading up to the incident. His leads to misunderstanding and the perpetuation of myths that should’ve long since been abandoned. Fair enough; it sells papers, generates clicks and while people who genuinely care/are interested in the animals will investigate further, those who don’t are of precious little consequence to their existence anyway… which I’ll concede is arguable, but that’s a totally different topic for discussion and I’m even starting to bore myself. Anyway, having made the massive digression which I insisted I didn’t want to make, I’ll conclude by contextualising this with our situation. 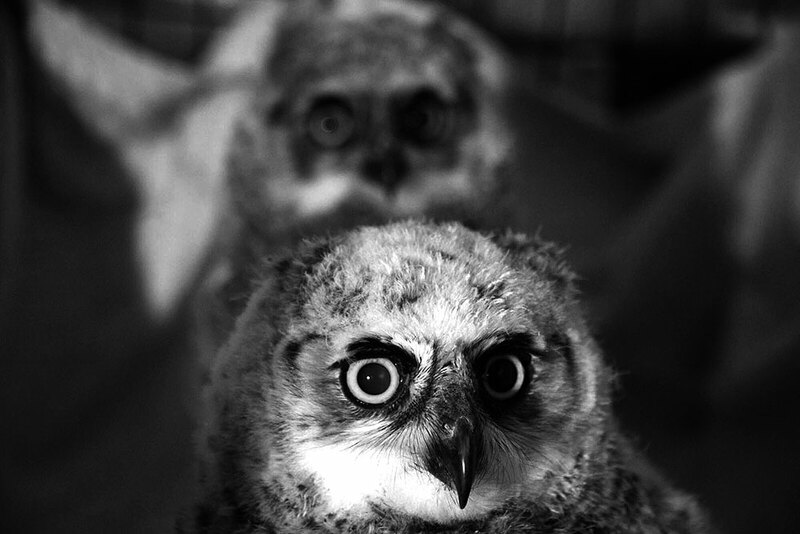 How well we train these owls is going to depend largely on our understanding of and response to their actions. We can’t just force what we think they need upon them, we need to understand the behaviour in order to effectively respond to it. Literally the exact opposite of politicians. Oh yes, I am provocative. 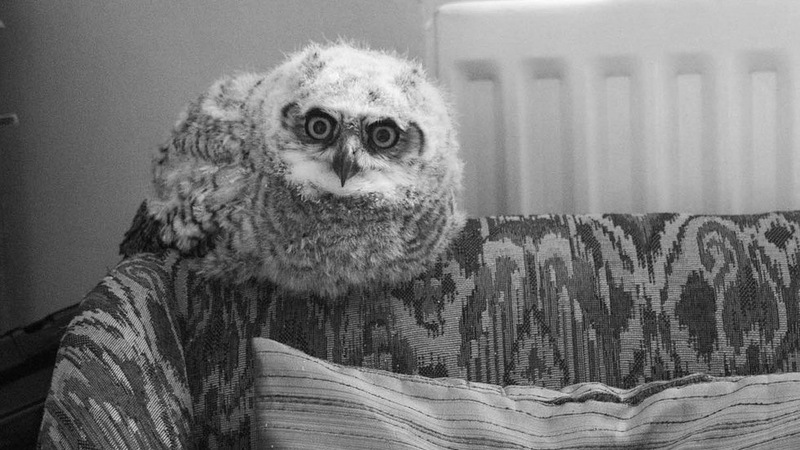 While the owls are too young for their beaks to be all that threatening, it’s quite a different story for their feet. Their toes are blessed with mini katanas; long talons which are bloody sharp and grip like me on monkey bars at the park (I’ve never been a big fan of heights). 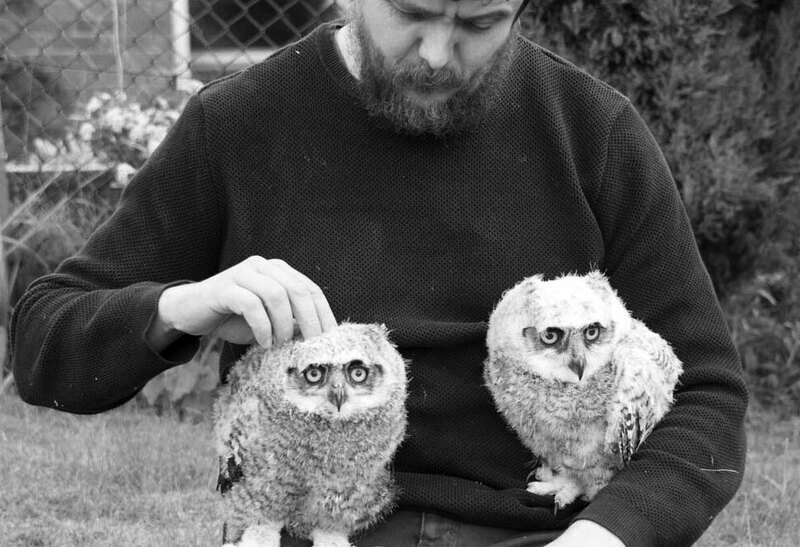 They are not yet used to being handled, so it’s only natural that they be nervous and grip excessively hard when we put them onto our arms or hands. They feel like needles and while they can’t puncture the skin to any great depth, it doesn’t take long for us to conclude that protective will probably be a good idea. Thankfully, my dad owns an engineers merchants and we’re soon blessed with a pair of welding gloves. Yes, those are sharp. Yes, they hurt. Yes, I probably should just wear gloves. I’ve not yet spoken about their feeding, interaction/reaction to other animals or initial attempts at flight, which are all topics I’ll retrospectively cover in the coming weeks. Like I say, for now we’re just getting our heads around the basics, their personalities and starting a few routines. What I will highlight, is just how surprised I’ve been by the distinctness of their personalities. 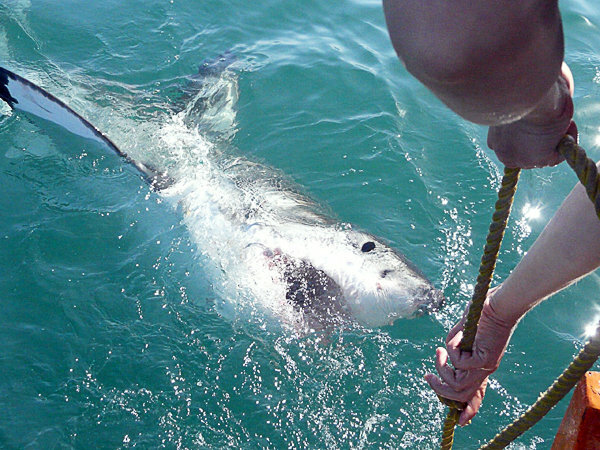 It was the same with great white sharks; it wasn’t until I spent a continuous amount of time with a few of them, that I appreciated just how unique a character each animal is. Sassy Girl comes across as bold and confident, while Stupid Boy has been far, far more introverted. It’s almost as if calling him Stupid Boy has had an adverse effect on his confidence and self-esteem. But I have faith in him. Mark my words, this boy will bloom before he leaves us. And if he doesn’t, I’ll blame Anna.